An excellent way to spend a free weekend can be had by taking Shanks' pony (i.e walking!!) from the popular Scottish tourist town of Dunkeld to the equally well patronized Pitlochry. Away from the buzzing A9 trunk road, the two centres are linked by a wonderfully wild path which caresses the edges of no less than seven lochs (and one dam) en route. The first stage of the walk, from the Cally car park to Loch Ordie, is described in detail in the North From Dunkeld route so follow directions given there until Loch Ordie is reached (Point 4). From Loch Ordie, continue along the western shore and follow the path which curves left and then right, passing underneath an electricity line before crossing a small stone bridge over a burn. The track here is bounded by woodland on the left and passes through two small gates. At the next junction continue straight on until you reach the dilapidated ruins of an old stone cottage, inhabited now by a forest of nettles. A grassy area to the front of this ruin is littered with the bleached remains of dead wood and makes a handy place to stop for a drink. Continue in a northerly direction from the cottage and into a small dip where the track branches again. This time take the right hand branch up and over a small rise before climbing a deer fence. The path continues in an easterly direction over fairly featureless heather scrubland. 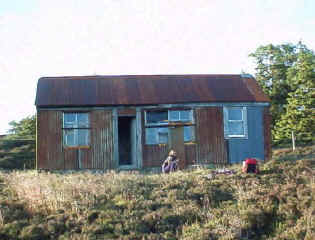 As you make your way across the moor you will get your first glimpse of Sarah's Bothy to your north. The bothy seems tantalisingly close but the path takes you away and down into a hollow where the corrugated shelter is temporarily lost from view. Half an hour of steady walking will bring to to the bothy where, if you are not carrying camping equipment, you can shelter for the night. The bothy (pictured right) has a wood burning stove inside if it is cold and a handy little cooking pit outside where we barbecued our sausages. One tip however, always check the cooking pit for wildlife before starting your fire. 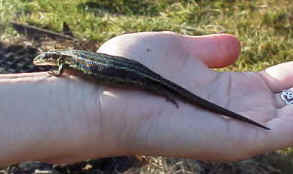 We discovered a lizard (pictured below) inside on our visit, fat from eating scraps left by previous visitors! If you are not staying at the bothy then the little copse of trees nearby makes a pleasant spot to pitch your tent for the night. 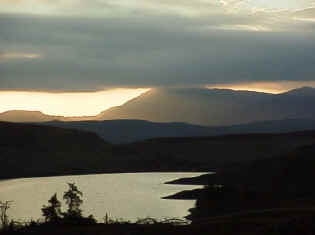 When walkscotland.com walked this route in July we were treated to a spectacular golden sunset over Lochan Oisinneach Mor (pictured top of page) from this spot. From Sarah's Bothy, follow the winding track in a northerly direction as it gradually loses height until your path is barred by a high locked gate. A stile on the right hand side gives access and the path continues until you reach Lochan Oisinneach Beag. Follow the track which curves left and heads off in a south westerly direction back to the north shore of Lochan Oisinneach Mor. A couple of little gravely beaches give access to the lochan which makes an ideal location for an early morning swim. Another tip, if you are male and unencumbered by swimming trunks watch out for those pike that the loch is renowned for! The path branches again here, turn right and climb over a small rise which takes you onto a large heathery moor. Follow the track as it continues west, passing the ruined cottage at Achnahosher, to eventually arrive at a small sheep station. Pass through the gate on your right and head north towards Loch Broom. The densely forested Faire Mhor, with its attendant telecommunications tower on top, dominates the view ahead. About half a kilometre from the loch, the path branches again, the left branch takes you to a boat house while the right one leads you around the loch's eastern shore. Go right and walk round the water before entering the forest at a high gate and stile just beyond a little fishing hut and boatshed. The path takes you up through the woods and bears left for the climb towards the mast. The track skirts the summit of the hill and leads down through the Tom Beith estate and past the farm at East Haugh where the noise from the A9 once again assaults the ears. The walk into Pitlochry along the tarmac road adjacent to the dual carriageway seems to take a long time but in late summer the wild berries growing along the route are a pleasant distraction. If, like us you had run out of water, the real oasis is the BP station which appears at the town's boundary! To make your way back to Dunkeld you can either take a bus or a train. Trains depart about every two hours from Pitlochry Station and there are both local and Scottish Citylink services from Pitlochry's main street to Dunkeld, although services are limited on Sundays. WALK FACTS - Distance: Approx 29 miles. Map: OS Landranger 52. Start/ Parking: Cally car park off the A923 north of Dunkeld. Grading: A long walk through fairly remote terrain. No real strenuous climbing is involved but it goes without saying that a decent level of fitness will be required. You must also be prepared to carry enough equipment, food and water to last two days. There are occasional burns along the route as far as Loch Broom, but from there on there is no decent surface water. If you're taking water from lochans, be sure to boil or treat it before drinking. Sarah's Bothy is served by a small well in the gully below.